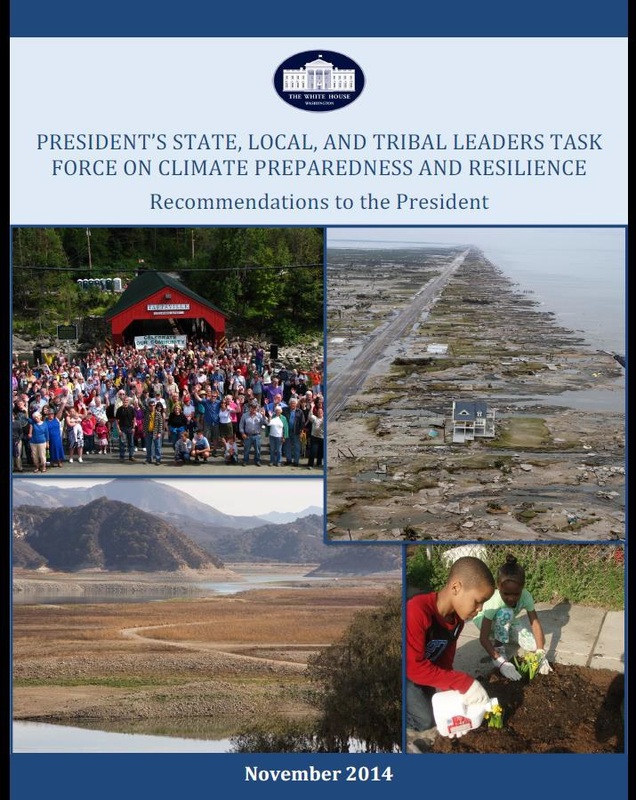 The White House last week released a long-awaited report from the Task Force on Climate Preparedness and Resilience, the result of a yearlong effort to distill the collective experience of state, local and tribal governments dealing with extreme weather events into recommendations to enhance the help available from federal agencies. The task force was supported by staff from the Council on Environmental Quality. Its members, representing 28 state and local jurisdictions across the nation, proposed changes to federal programs and practices in a number of key domains, including disaster recovery, infrastructure investment, natural resource management, human health, community development, and agriculture. Participants included officials from three states – Delaware, Maryland and Vermont – and two cities – Hoboken, New Jersey and Philadelphia, Pennsylvania – located within the area that comprises the Council of State Governments/Eastern Regional Conference. The report’s content directly reflects the lessons learned in U.S. states and municipalities as they grappled with the impacts of unusually severe tropical storms, floods, heat waves and droughts, among other manifestations of changing climate patterns that have hit the nation with particular force since Hurricane Katrina devastated the Gulf Coast in 2005. In addition to recommendations for revised federal policies and procedures, the group assembled an online toolkit containing a raft of resources that will allow state and local officials to access historical data on climate and coastal conditions, models that forecast future climate patterns and sea-level rise, and instruments for mapping regional and even community-specific flood vulnerabilities. In addition, the toolkit provides examples of individual projects that have incorporated such data to become climate-ready in the face of anticipated challenges. The report stresses the importance of coordinating programs and activities across traditional boundaries. It calls for an integrated approach among individual federal agencies that now tackle climate impacts from different perspectives. It also encourages collaboration among various levels of government — federal, state, regional and local — whose jurisdictional limits may be irrelevant to the impacts of a changing climate and present obstacles to the job of increasing resiliency, says the report. Given the scope of the problem, the federal government needs to integrate information about climate vulnerabilities and risks into all areas of policy, investments and practices rather than viewing it as a free-standing issue, addressed through separate guidelines, the report says. To demonstrate the necessary shift in approach, the report recommends that the federal government lead by example through its management of its own operations and assets. In addition, the report enumerates the types of scientific and technical support that federal agencies are most capable of developing and providing to other levels of government, and asks in particular for help that allows small communities to build the needed capacity for planning and implementation that will ensure improved preparedness and resiliency on the ground. Underlying all these recommendations is the task force’s recognition of the immense toll that severe weather has taken, and will continue to take, on public health and the national and local economies. “To prepare for these changes, all facets of public, private, and civil society will need to engage in developing new partnerships and strategies to make the best investment decisions possible and reduce the costs of climate impacts that cannot be avoided,” the report says. Where possible, federal agencies should highlight best practices that integrate climate-change mitigation and adaptation, the report adds. Because it is one thing to make recommendations and another to assure that changes are carried out in a timely and coherent fashion, the force report ends with a request that the administration develop “a transparent and structured [implementation] process” that incorporates an ongoing dialogue with the state, local, tribal and territorial governments on the front lines of building preparedness and resilience. The group asks that a federal official be appointed and granted responsibility for ensuring that its recommendations are implemented across agencies. In addition, task force members suggest that mechanisms be developed to track and report on progress, perhaps through a meeting or information forum scheduled for a year from now. CSG/ERC will be providing a Q & A with task force members from our region in the coming weeks. Please check back here after the Thanksgiving holidays. This entry was posted in Climate Change, Resilience, Severe Weather. Bookmark the permalink.